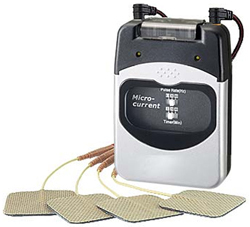 So you might know all about TENS Pain Relief, but what about Microcurrent therapy, also known as Microcurrent Electrical Neuromuscular Stimulation (MENS) or microamperage electrical neuromuscular stimulation? Tongue twisting terms - but effective and clinically proven to help with a myriad of pain related medical conditions and loved by Clinicians and users alike. Unlike TENS units which use electrical currents for pain relief the microcurrents are so weak in the MT-330A Microcurrent Machine that they won’t stimulate sensory nerves, so the user won't feel any shock-like sensations, but the pain relieving and anti-inflammatory benefits can be immense. Microcurrent therapy uses really low-level electrical currents (microcurrents) to treat nerve and muscular pain and inflammation. It is particularly effective for the relief of pain because of its close proximity to our own body's current, and it is this characteristic that make many Clinicians prefer microtherapy over TENS pain relief. Because microcurrent therapy works on a cellular level it is thought to be more effective, and more 'in tune' with the human body. What conditions will benefit from Microcurrent Therapy? How will Microcurrent Therapy give me pain relief? The human body is a wonderful thing; did you know that each tissue type in the body has its own individual electrical frequency? This 'signature' can be disrupted by injury or disease. Microcurrent therapy works by simply restoring these normal frequencies deep within the cells delivering outstanding levels of pain relief, reducing inflammation and improved muscle function. What actually happens is that within the cells the microcurrent therapy actually stimulates a big increase in Adenosine triphosphate (ATP). ATP transports chemical energy within cells for metabolism and increases protein synthesis, which is necessary for tissue repair - which is just what you want with damaged, in pain tissue! Microcurrent therapy also improves circulation and blood flow to the area reducing inflammation which in turn reduces muscle pain and muscle spasms. Users find with repeated treatments - all in the comfort and privacy of the home remember - that benefits will increase and improve over time with use. This cumulative effect makes it a hugely popular treatment for inflammation and pain. The MT-330A Microcurrent Machine is a registered medical device and uses electrode pads which stick to the skin to transmit the mild electrical pulses direct to the area of pain or inflammation. Spare electrode pads are readily available, and please take care to purchase quality pads rather than cheaper ones. As the saying goes - you get what you pay for - and our pads will last at least 20 sessions (even longer if you keep them cool in the fridge!) and have high quality copper wires in the pad to ensure you won't get any 'hot spots'. This is not the case with cheaper electrode pads and treatment effectiveness can be compromised by using inferior pads. Please do not use this microcurrent machine if you are pregnant, or if you have a pacemaker fitted, or you have cancer, without instruction from your GP or healthcare provider.